Eight Sassamatt Collective photographs are in the North Van Art Rentals collection, three by Phyllis Schwartz and five by Edward Peck. The two most recent acquisitions will be on show in Art Rentals Show, a salon syle exhibition. The exhibition runs 14 February – 15 March (Cityscapes, 355 Lonsdale, North Vancouver). Work on show is available for rent or sale. This is an excellent opportunity to buy more art and get in to the spirit of Valentine’s Day. Longevity, new work by Phyllis Schwartz, is a selection from a series of Lumen Prints made at Finn Slough. Seeding the Wind, new work by Edward Peck is a selection from Arrangements, a series of images that captures flowers as they transition from bud to bloom to death. Longevity is a Lumen Print from a series of photograms made from plant materials gathered at Finn Slough, a tiny fishing community in Richmond British Columbia, Canada, where approximately 30 residents live in wooden houses along a marshy riverbank. The indigenous and cultivated plant materials used to make the photograms reference a community that is inextricably connected to the environment and persistently adaptable to the encroaching built environment that challenges its existence. Of particular interest are the ginkgo leaves, an ancient plant that has adapted to environmental transformations or thousands of years. The ginko tree, one of the most ancient plant forms dating back 2.5 million years, is a symbol of longevity. 170 ginkos survived the atomic bomb dropped on Hiroshima in 1945. Artists by nature are not hard-wired to boost, promote, or sell their work. Buyers usually want to know more about the works that attract their attention and perhaps purchase. That more can be the backstory, the technique or inspiration, and it is often said that it is not the work that is sold but the story that is bought. For some artists, that conversation is difficult. In my own artist practice, all of this is the case. If I could bring that story to life in conversation, there would be no need for me to make a drawing, photograph, artist book or ceramic sculpture. I came to value (and now miss dearly) art school critiques because I learned how to speak more confidently about the backstory, techniques and inspiration in my artist practice. Having said that, this blog feels somewhat like shameless self-promotion, but it could also be a year-end summary of where my work can be found, where this work can be purchased. 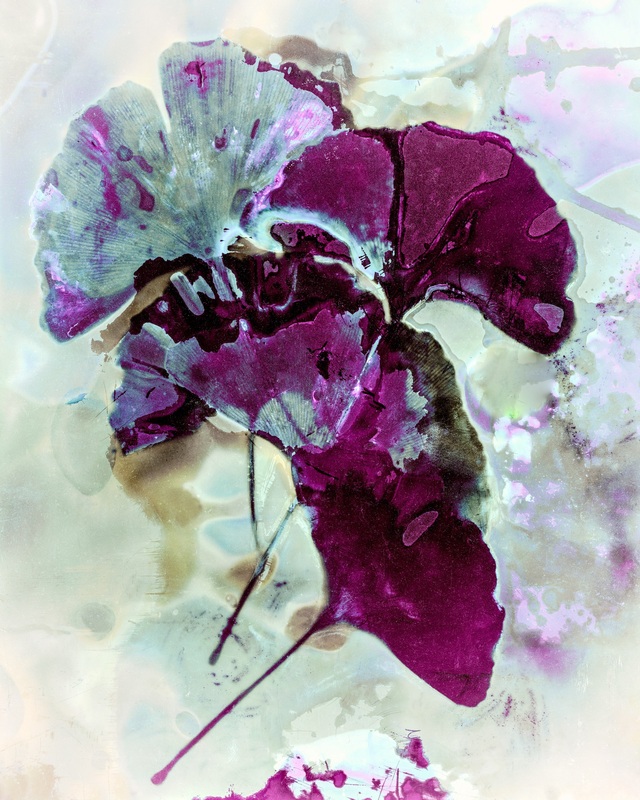 TRUTH AND BEAUTY Digital Gallery presents Illuminations, a selection of my recent lumen prints. This exclusive, inaugural Online Exhibition aims to reach a broad international audience and enhance ongoing programming at the Vancouver gallery. Visit the DIGITAL GALLERY to enjoy this inaugural exhibition of Lumen Prints. CITYSCAPE ART RENTALS (335 Lonsdale Avenue, North Vancouver) holds a small collection of my work for rent, rent-to-own, and purchase. A selection of my work will be exhibited the 2018 Art Rental Show (opening 11 January through 03 February 2018). If you are in Texas, Ocean Shores, one of my Lumen Prints is among the 39 alternative process photographs on exhibition in unique: alternative processes at ASmith Gallery in Johnson City, Texas thru 14 January 2018. This exhibition affirms my interest in what constitutes a photograph and the experiments, historical and contemporary, which push the boundaries and yield unique results. It is also available for purchase. If prints could talk, Ocean Shores might tell the viewer that it is a trace and shadow of purple broom buds native to the craggy Pacific shore. Chamaecytisus purpureus, less prominent than the common yellow broom, is now considered an invasive plant consuming beachfront real estate. It was the colour of this broom that first attracted me to collect a few sprigs for a series of Lumen Print impressions made on sheet film. What remained after a full day in the sun was a photogram that would be transformed into fixed images using sodium thiosulfate. Next, the sheet film was scanned and again transformed in a digital photography space where I constructed an image reminiscent of the plant material, the residual sand and the light falling on the shore at dusk. Currently, Ocean Shores is among the 39 alternative process photographs on exhibition in unique: alternative processes at ASmith Gallery in Johnson City, Texas thru 14 January 2018. This exhibition affirms my interest in what constitutes a photograph and the experiments, historical and contemporary, which push the boundaries and yield unique results. When I agree to submit to an exhibition, I surrender, leaving curators and preparators to work their magic. In this space, the image is again transformed when set in a visual conversation among unique alternative process photographs selected by Christina Z. Anderson. TRUTH AND BEAUTY Digital Gallery presents Illuminations, a selection of my recent lument prints. This exclusive, inaugural Online Exhibition aims to reach a broad international audience and enhance ongoing programming at the Vancouver gallery. Illuminations, a series of Photograms, assembles impressions of materials placed on photosensitive paper using organic materials gathered from the beach, the forest, and the street. I record traces and shadows made by the various debris on sheet film. These handmade negatives are then digitized and transformed into an illumination of their original organic form. Visit the DIGITAL GALLERY to enjoy this inaugural exhibition of Lumen Prints. Eleven Sassamatt Collective photographs are in the Cityscapes Art Rental collection, five by Phyllis Schwartz and six by Edward Peck. They will be on show in their September salon syle exhibition. The exhibition runs 08 – 30 September (Cityscapes, 355 Lonsdale, North Vancouver). Work on show is available for rent or sale. This is an excellent opportunity to buy more art.